I realized recently that a lot of the things Gleason Sensei has been talking about in his Aikido classes (dynamic tension, pulling silk, stretching the fascia, etc) are very similar to the term “tensegrity,” coined by Buckminster Fuller in the 1960s. I first came across the term in 2006 when someone posted a table support built using this concept. None of the support pieces touched each other, but were held together in space by cables under tension. Tensional integrity has an interesting structural property in that it enables the creation of extremely rigid structures. Perhaps some martial artists had intuitively understood and were able to manifest using the body’s fascia and skeletal system. I am not positive about this, but it is an intriguing thought. 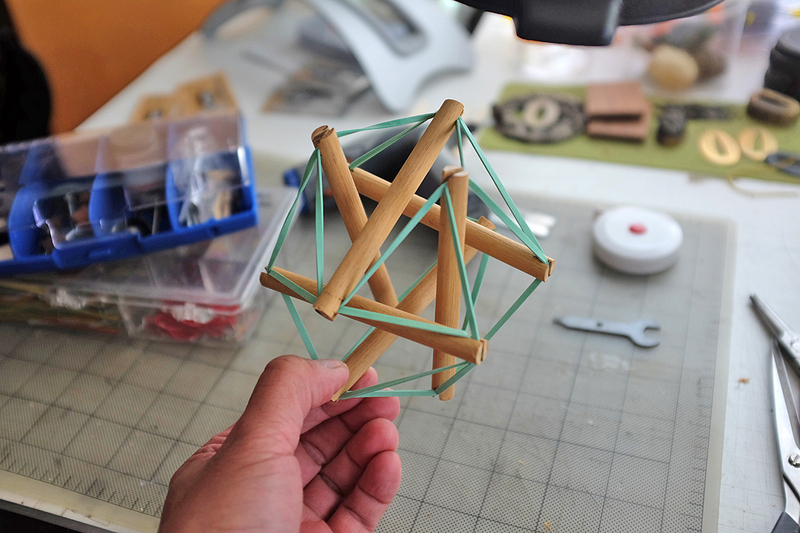 Once I remembered this, I, of course, spent an entire morning trying to build a Tensegrity Icosahedron using wooden dowels and rubber bands. After a few starts and stops, I finally managed to assemble one. It is amazingly strong and stable, yet quite energy absorbing…a most interesting thing! The structure is neither strong nor stable until the last band is in place. In fact, it “fights” being assembled. However, once all the bands are in place, all of a sudden the forces are in balance and the object is stable! Note that none of the dowels are touching each other. They are separate in 3D space. I used rubber bands because it was easier to put together. However, the structure will work with strings, steel cables, or fishing lines. The principle of tensegrity is that the when the forces are in balance and applied to the unit as a whole, tension and structural integrity is achieved. 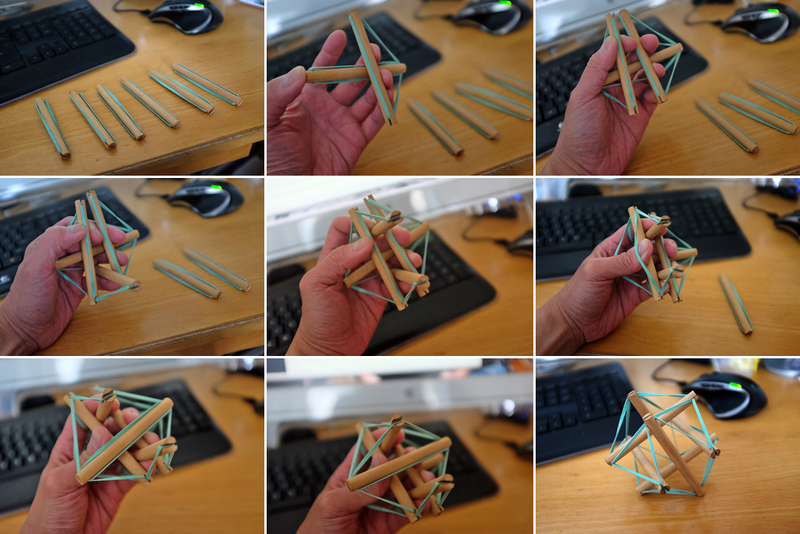 There are a lot of videos on YouTube on how to construct a Tensegrity Icosahedron, but to really get a feel for the forces involved there is nothing like assembling one while trying to hold all the pieces in one hand at the same time. BTW, this thing is so stable that it will actually bounce!